A well-hidden redguard resistence hideout east of Dragonstar at -110, 12. I think it was supposed to be active. In case of doubt, you can read through berrys posts in the respective exterior claim. But I'm rather sure that this place is actively used by insurgents. It's not so secret anymore with a road running just next to it, too. Perhaps some reconceptualizing might be due. Maybe the legionnaires are involved in banditry here too (similar to this BM quest)? Or maybe they are aware of Redguard rebels here and even have them under their informal protection, to prevent future bloodsheds from Nords? They would keep hot-headed Redguards at the bay too, of course. The cave may be abandoned as well. There are no signs in the exterior file that would declare it one way or another. I don't really agree on that. 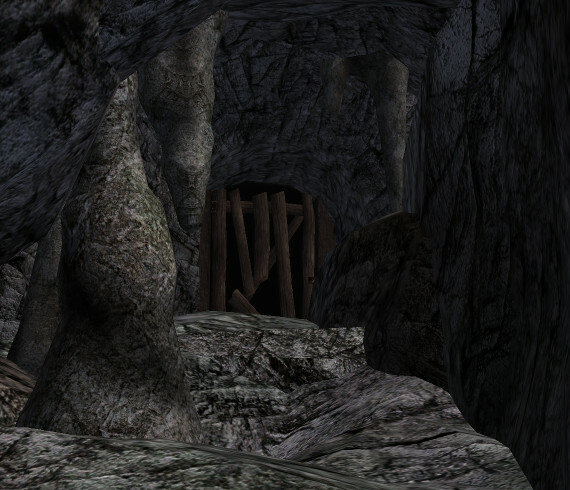 It's objectively much better-hidden than the cavesystem below karthwasten. Having the insurgents in proximity of roads and cities is exactly how it should be like, in my opinion. Forgive me the harsh disagreement. Yeah, it's right at the base of that valley, I wouldn't worry about it being 'obvious' either. Perhaps there can be a rumour of an active banditry ring in the area, with the garrison unable to track them -- ironically they are not that far away! Shell finished. Some work done on the living quarters, training room and storage. The player will have to be careful when entering, as there is a spikeworm pit to jump across. The empty cave next to the training room will be an armory. Make sure to make use of some of the new Rga gear. Illegal to sleep: No. Good. T_Rga_Furn_Burner02_128 bleeding too far into ground. Light_Com_Candle_12_77 bleeding slightly into ground. Should be ready for merging into Sky_Main. Since this has not yet been merged, I made a few additions/changes. Merged to Sky_Main as "Kulmar Cavern"